Blue Addicted and Giveaway closed! 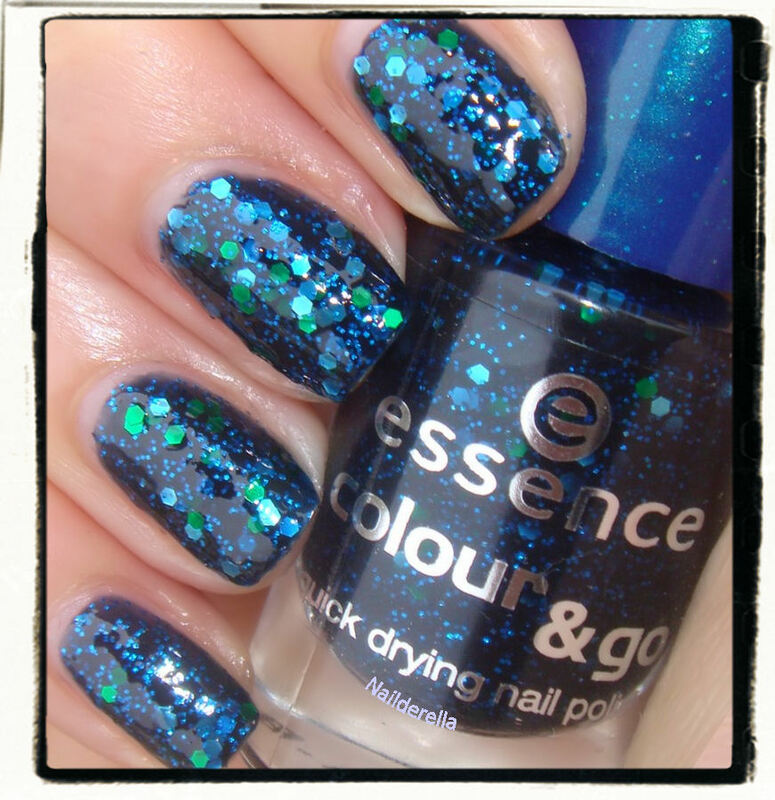 Have you head about the new Essence Colour&Go collection? They have released a bunch of new mini nail polishes! You can see all the new colors here. 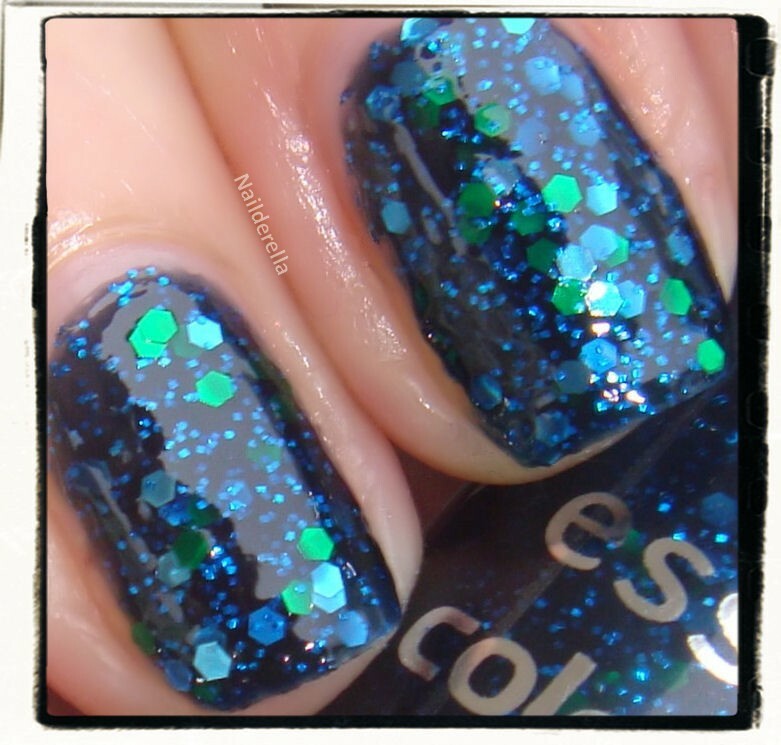 I'm quite excited to present this polish today because it is said to be a dupe for Deborah Lippmann's Across The Universe, a polish released for Fall 2010. So here are the pictures of "Blue Addicted". This is a dark blue jelly packed with small blue glitters and large green and blue hex glitters! It looks spectacular on the nails. Very shiny and festive but with a kind of dramatic dimension due to the dark base. Final verdict: This is a very ocean-like polish...with its deep blue jelly and moreover you have the bling bling of the glitters that gives a more festive aspect to this polish. 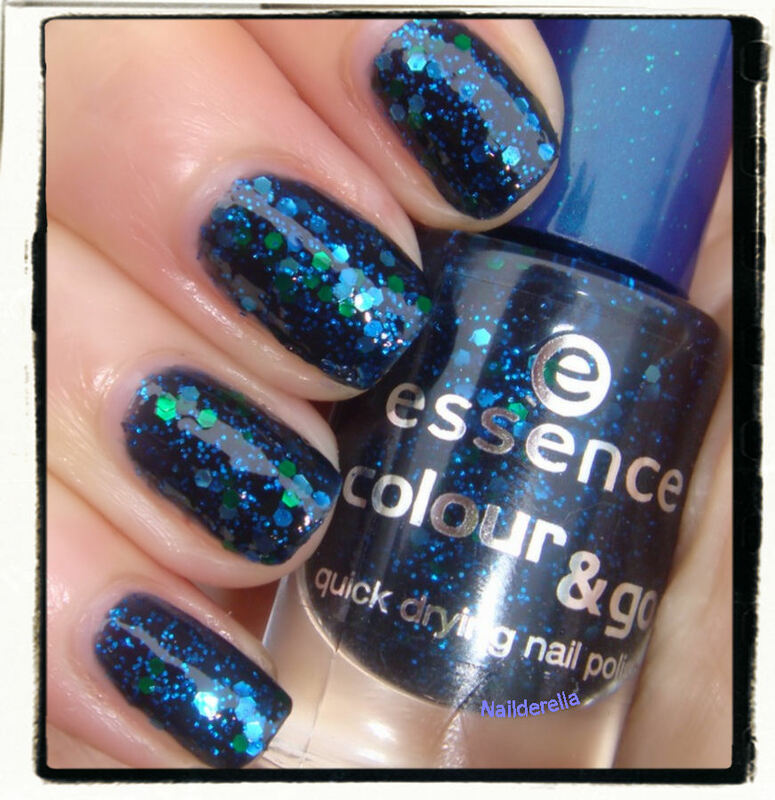 It is believed to be a dupe for Deborah Lippmann's Across The Universe. I don't have this polish but from what I've seen, they seem indeed really really close. The major difference is their price, I guess. Across The Universe costs $18 (for 15 mL) while Blue Addicted is around $2 (for 5mL)! The application of Blue Addicted was a little tricky because the polish is rather thick but this is not something unmanageable. As it's a jelly, it needs 3 coats to be fully opaque. Overall, I think it's a very nice polish that Essence launched and I'm very happy to see they make really trendy polish for also a nice price. Is there any polishes from this new line you're interested in? The winner will be chosen randomly soon! So stay tuned! I love this!! I need it. I don't have Across THe Universe or anything that looks like it! Wow look at all those glitters ! I recently bought my first essence polish and it applied like a dream. Unfortunately, my ULTA doesn't frequently restock them. I will have to go hunting for this one, though. It is gorgeous! now i need to buy that nail polish! it's awesome. Tiens question bête, t'es de quelle ville ? L'autre jour je faisais le tour des blogs suisses et je me suis demandée d'ou tu venais réellement, il me semble pas que tu me l'aies dit. Ah on est "voisines" alors ^^ Je suis de GE aussi, on est pas mal de blogueuses à GE. Héhé Je l'adore celui ci !! Et en plus il est lisse, quelle merveille <3 Contetne de découvrir ce blog, j'aime bcp ! OMG! this is totally gorgeous nail polish color! looks amazing!